Welcome to the official website of The Universal Archconfraternity of Saint Philomena – often referred to by devotees worldwide as “The Family of Saint Philomena.” The Universal Archconfraternity of Saint Philomena brings together all of the Saint Philomena organizations, groups, centers and confraternities worldwide. The Universal Archconfraternity of Saint Philomena is recognized is within the Catholic Church and is the only officially recognized movement of devotion to Saint Philomena. For all things regarding St. Philomena, you have come to the right place! The Universal Archconfraternity of Saint Philomena is an international, worldwide movement of the faithful devoted to St. Philomena the Wonder Worker and Virgin Martyr that promotes the love of Our Lord Jesus Christ and His Holy Mother the Virgin Mary. Individual Centers, through their local autonomy, promote the devotion to Saint Philomena and support the work of the Sanctuary of Saint Philomena. This officially sanctioned website works diligently to keep visitors informed of important happenings regarding Saint Philomena globally, as well as important to information of local interest. Our core goal is very transparent; we seek to deliver a simple truth, the same truth that inspired our Saint Philomena almost 1750 years ago. We seek to inform others of the paramount importance of the way St. Philomena chose to live her life – a life of Heroic Christian Purity. Saint Philomena, if she had so chosen, could have become the Empress of Rome, the highest position of wealth, power and influence imaginable. Yet she chose to honor her promise of Chastity to Our Lord Jesus Christ. In so doing forsake materialism, ego and pride. Her example and message of Heroic Christian Purity is immensely important to the youth of our time. This child Saint was allowed by God to be kept hidden in the catacombs until the moment He knew she would be needed most. That time is now – for the world has great need of her unselfish example. There is work to be done and no time to waste. “Behold, your mother” (John 19:27) At the cross, Jesus makes Mary the Mother of us all, crowned with twelve stars. (Revelation 12:1) She is Queen of heaven and earth and sits beside Jesus as our intercessor. 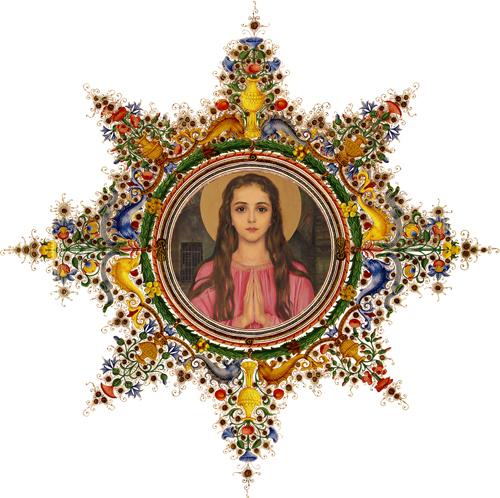 Few saints across the Catholic universe have endured as much controversy as the child-saint Philomena. Yet she enjoys the ardent adoration of many millions of people of God around the globe. Her devotees include old and young alike, of diverse cultures and social standing. Philomena has been credited with countless miracles and intercessions since discovery of her tomb in the catacombs of St. Priscilla in 1802. This child, who willingly traded her earthly life for heavenly salvation, continues her work today promoting the virtues of purity and chastity among the world’s youth and bringing the faithful closer to our Blessed Mother Mary and Jesus Christ. A non-profit organization has been created to facilitate the promotion of St. Philomena across the USA and to support the maintenance and operations of her final resting place, the St. Philomena Sanctuary in Mugnano del Cardinale, Italy. This organization was proposed to the St. Philomena devotees of America by Msgr. Braschi during the September 2011 Conference at the National Shrine of Our Lady of Snows outside St. Louis, MO. By personal check payable to the "Sanctuary of Saint Philomena." For security reasons, please send your donation through registered or express mail to the Sanctuary's address at the bottom of this newsletter. Our Mission is to spread the Word that is Jesus Christ in the style of the Saints. Through print and electronic media marketed worldwide, The Universal Archconfraternity of St. Philomena, endeavors to evangelize, inspire and inform those who search for God and seek a richer Catholic, Christian, human life. Our efforts help spread devotion to St. Philomena V.M. and support the Sanctuary of St. Philomena wherein rests the Sacred Body of Saint Philomena. We work hand in hand with the Sanctuary of St. Philomena to identify which project requires funding in order to keep this holy place well maintained and taken care of and we help devotees find this spiritual and sacred place. For centuries, our cherished Catholic faith has been passed from person to person and parent to child. Each of us carries in our heart a special memory of how God first graced us with the knowledge of the faith and how Our Blessed Mother and Saint Philomena, changed our lives and brought us closer to Christ. In our work in the Universal Archconfraternity of St. Philomena, we see firsthand how millions of souls are currently living without that knowledge of God and are living outside of His grace. We have been given a beautiful opportunity to carry out Christ’s work and pass on our faith and blessings to others in the example of St. Philomena, who would otherwise never be introduced to Our Lord, the Savior of all mankind. Just as we pray for the souls in Purgatory who have no one to pray for them, we should also make it a part of our life’s mission to pass on our faith to as many souls as possible who have no one else to pass it on to them, who don’t know Our Lord and His promise of salvation. By giving a donation to the Archconfraternity you enable us to spread devotion to St. Philomena worldwide. St. Philomena will bring Our Lord Jesus Christ and Our Bless Mother into the lives of those she touches. We know this through the numerous testimonies of devotees. Create the devotion items, prayer cards, information leaflets and membership cards. Supports the Sanctuary of St. Philomena where the Sacred Body of St. Philomena rests. Please note: All workers and center representatives work on a voluntary basis for the love of St. Philomena. Help us bring Jesus Christ our Lord to others through St. Philomena V.M.